Someone at our makerspace found a fun Halloween project we could do at Coder Dojo: a motion sensing pumpkin that laughs evilly when anyone comes near. Great! I've worked with both PIR sensors and ping rangefinders, and it sounded like a fun project to mentor. I did suggest, however, that these days a Raspberry Pi Zero W is cheaper than an Arduino, and playing sounds on it ought to be easier since you have frameworks like ALSA and pygame to work with. The key phrase is "ought to be easier". There's a catch: the Pi Zero and Zero W don't have an audio output jack like their larger cousins. 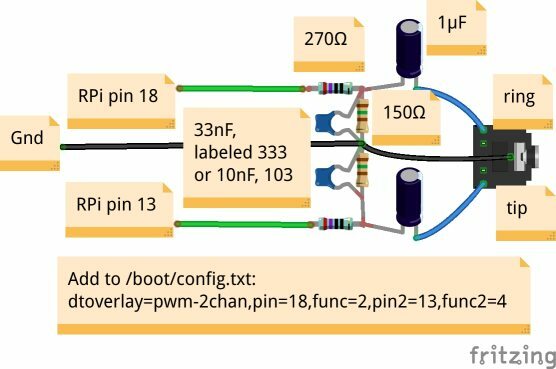 It's possible to get analog audio output from two GPIO pins (use the term "PWM output" for web searches), but there's a lot of noise. Larger Pis have a built-in low-pass filter to screen out the noise, but on a Pi Zero you have to add a low-pass filter. Of course, you can buy HATs for Pi Zeros that add a sound card, but if you're not super picky about audio quality, you can make your own low-pass filter out of two resistors and two capacitors per channel (multiply by two if you want both the left and right channels). There are lots of tutorials scattered around the web about how to add audio to a Pi Zero, but I found a lot of them confusing; e.g. Adafruit's tutorial on Pi Zero sound has three different ways to edit the system files, and doesn't specify things like the values of the resistors and capacitors in the circuit diagram (hint: it's clearer if you download the Fritzing file, run Fritzing and click on each resistor). There's a clearer diagram in Sudomod Forums: PWM Audio Guide, but I didn't find that until after I'd made my own, so here's mine. If you need to adjust the volume, run alsamixer and use the up and down arrow keys to adjust volume. You'll have to press up or down several times before the bargraph actually shows a change, so don't despair if your first press does nothing. That should play in both channels. Next you'll probably be curious whether stereo is actually working. Curiously, none of the tutorials address how to test this. If you ls /usr/share/sounds/alsa/ you'll see names like Front_Left.wav, which might lead you to believe that aplay /usr/share/sounds/alsa/Front_Left.wav might play only on the left. Not so: it's a recording of a voice saying "Front left" in both channels. Very confusing! That will play those ALSA voices in the correct channel, alternating between left and right. (MythTV has a good Overview of how to use speaker-test. Of course, if you want better sound quality, there are various places that sell HATs with a sound chip and line or headphone out. Jumpstarting the Raspberry Pi Zero W: Now Available via Humble Bundle! My new book is now shipping! And it's being launched via a terrific Humble Bundle of books on electronics, making, Raspberry Pi and Arduino. Humble Bundles, if you haven't encountered them before, let you pay what you want for a bundle of books on related subjects. The books are available in ePub, Mobi, and PDF formats, without DRM, so you can read them on your choice of device. If you pay above a certain amount, they add additional books. My book is available if you pay $15 or more. 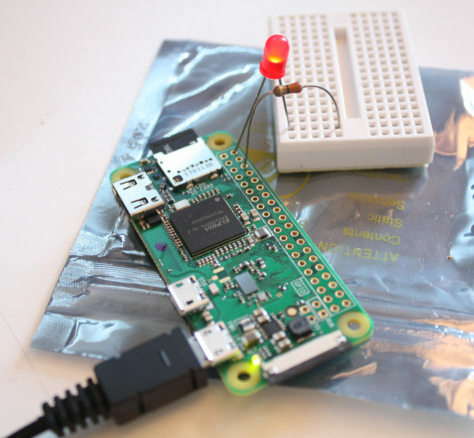 A Wearable News Alert Light Show: wire up NeoPixels or DotStars and make them respond to keywords on Twitter or on any other web page you choose, plus some information on powering a Pi portably with batteries. All the code and wiring diagrams from the book, plus a few extras, are available on Github, at my Raspberry Pi Zero Book code repository. To see the book bundle, go to the Electronics & Programming Humble Bundle and check out the selections. My book, Jumpstarting the Raspberry Pi Zero W, is available if you pay $15 or more -- along with tons of other books you'll probably also want. I already have Make: Electronics and it's one of the best introductory electronics books I've seen, so I'm looking forward to seeing the followup volume. Plus there are books on atmospheric and environmental monitoring, a three-volume electronic components encyclopedia, books on wearable electronics and drones and other cool stuff. I know this sounds like a commercial, but this bundle really does look like a great deal, whether or not you specifically want my Pi book, and it's a limited-time offer, only good for six more days.